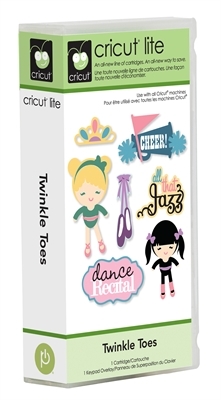 Welcome to CookingWithCricut.com and today's Cartridge Showcase! Chef Olivia of ORM Crafty Nights is taking over the reigns and sharing projects she has created using the Cricut Lite Twinkle Toes cartridge. This cartridge will dance right onto your favorites list for all things girly! It is filled with adorable images and great labels along with so much more. So without further ado . . . here's Olivia! Hello everyone! It is Olivia here from ormcraftynights. 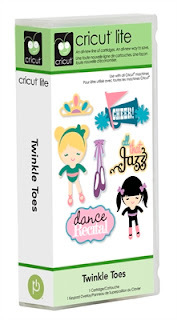 I am here to give you a sampling of some great ways to use the Cricut Lite Cartridge Twinkle Toes. Being the mom of three girls, I was super excited to use this cart but as you will see you are able to use it more then just for the girls. The first example is a home decor project I did for my youngest daughter, age 3, who just had her first dance recital two weeks ago. Be warned you may need your sunglasses for these colors. First I painted it the colors to match her dress. I then added the layout. The Twinkle toes girl was cut a 3 1/2 inches and I also cut the oval with the saying Dance Recital from the Cart too. I love to use part of their costumes so the tulle frame, flower and ribbon are pieces of her costume. I will be hanging this in her room. Next are two scrapbook layouts I did for her recital too. 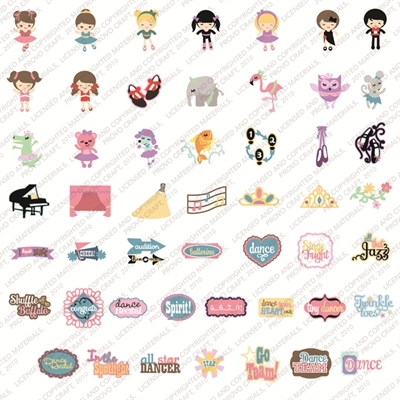 The titles, shoes, crown and flower swirls are all cuts from this cart as well. Now I have a non-girly idea. One of the things I love about this cart is that each piece is layered on each other including the words so you can just leave that out. I cut this star image in more masculine colors and used pop-ups to give it more dimension. I made this card for my oldest daughter favorite teacher. I stamped a sentiment in the middle this time. Hope I give you some ideas of how fun and cute this cart can be! Happy Craftin'. Wow what adorable projects! What a terrific way to showcase those QT Patooties of yours Olivia. Please be sure to head over to Olivia's blog and give her some great bloggy love for her wonderful inspiration! Also be sure to stop by tomorrow for our new Stamp and or Die Cut Challenge! As always, thank you so much for making us a part of your crafty time! Charlotte and the rest of the CWC-PCW Designers. What a terrific showcase Olivia! I loved the layouts! They were just precious! Thank you for sharing your talent and time with us! Great showcase Olivia! I have been trying to get this cartridge on Ebay for a while now... One day I'll have it. LOL Love the layouts and the card! Your showcase is absolutely adorable, Olivia! The frame and LOs are gorgeous -- great job! !